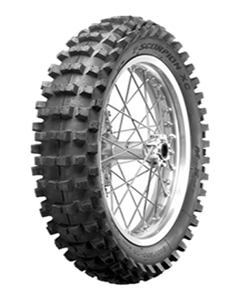 WORLD CHAMPIONSHIP OFF-ROAD TYRE with superb performance on a wide range of terrain. SPECIAL POLYESTER CARCASS to increase heating resistance in race conditions and to reduce weight without compromising on stability and cornering behaviour. Tyre contour and knob design for MAXIMUM TRACTION on soft to intermediate terrain. ALIGNED SIDE KNOBS ON FRONT WHEEL for optimised braking control and steering precision.